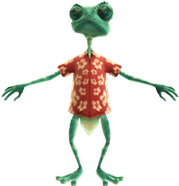 Where to Play Rango for Real Money? 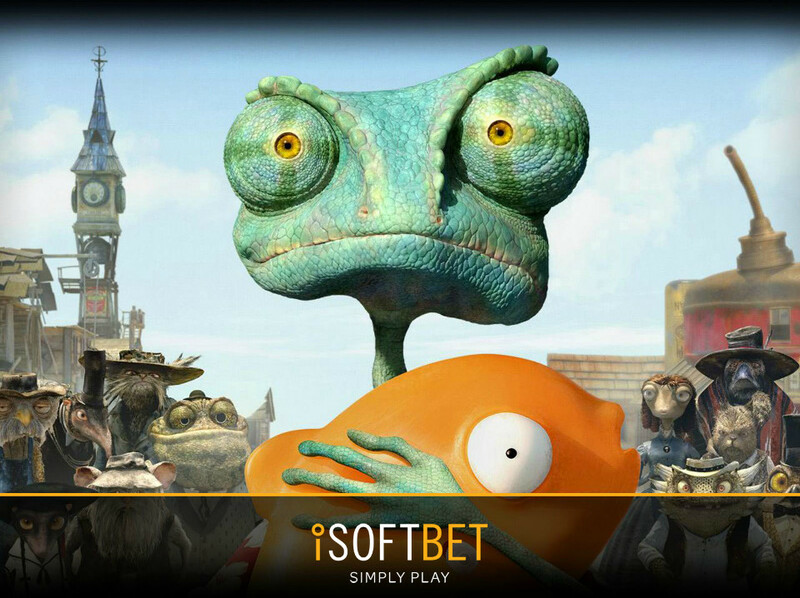 If you’re a fan of movies, you’ll already know that Rango is a movie from 2011 – albeit one that wasn’t met with universal acclaim. The fact that it wasn’t the greatest film of all time makes it strange that iSoftBet decided to make a slot about it, however their decision has been vindicated. This is because, unlike the film, this slot is something that most people will enjoy, thanks in part to its enjoyable theme. As soon as the game is loaded, players will notice that the screen is filled with color and a number of the movie’s characters. What’s more, there’s a Wild West soundtrack playing in the background, which is actually quite enjoyable to listen to. If it does get annoying though, there’s always the option to hit the mute button. But what about the symbols? Well, they are mainly taken by the characters from the film, including Rango himself, as well as Beans and Rattlesnake Jake. The other symbols are standard 9 to A ones, however these have been stylised to fit in with the theme, so actually add to the overall experience. So, regardless of whether you’ve seen the movie or not, you should really enjoy the theme at this slot. 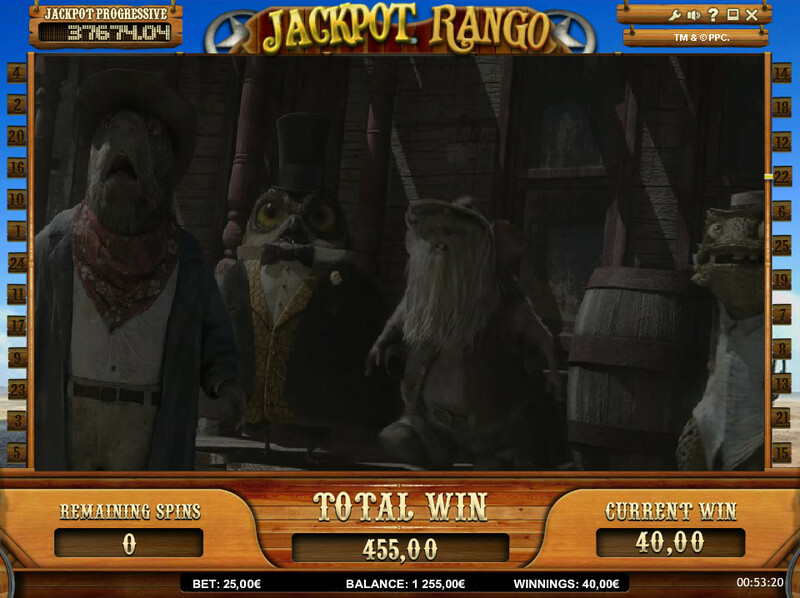 How to Play Rango Casino Game? This might be a kids’ film, but you still need to be an adult in order to play this game. The gameplay is pretty easy though, and most players will understand it within seconds. The first thing to do is choose how many of the 25 paylines you want to play, remembering that more paylines means more chances to spin in a winning combination. You can then adjust the amount you bet per payline, always taking into account the fact that higher bets lead to bigger potential prizes. Once you’ve made these decisions, it’s a simple case of hitting the “Spin” button and waiting to see how much you’ve managed to win. 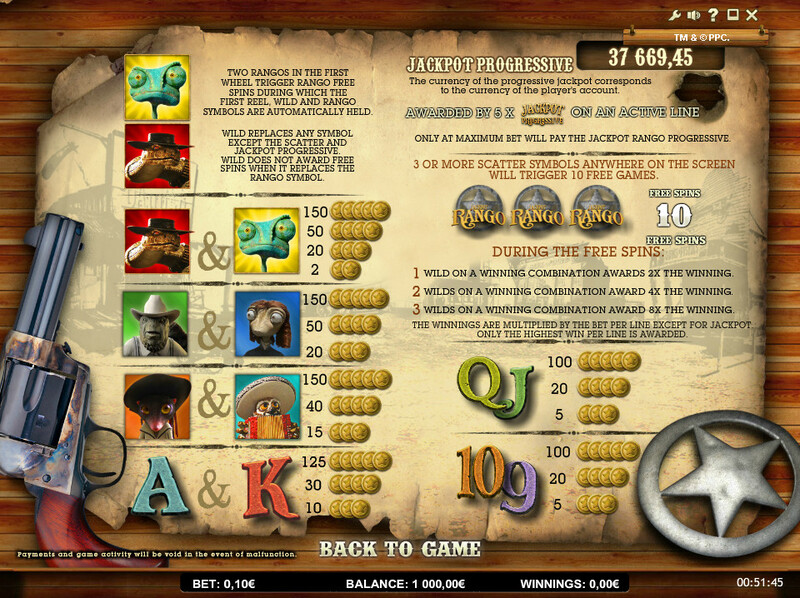 The jackpot at this slot – which is a progressive one – is won when spinning in five of the Jackpot Progressive symbols. Of the other symbols, the highest paying are all of the different characters. This is interesting, as it means that there’s no one symbol (aside from the progressive jackpot one) that is better than the others. The 9 through to A symbols are lower paying ones though, but only by a small amount. This means that, regardless of the combination you spin in, you should get a reasonably good win. 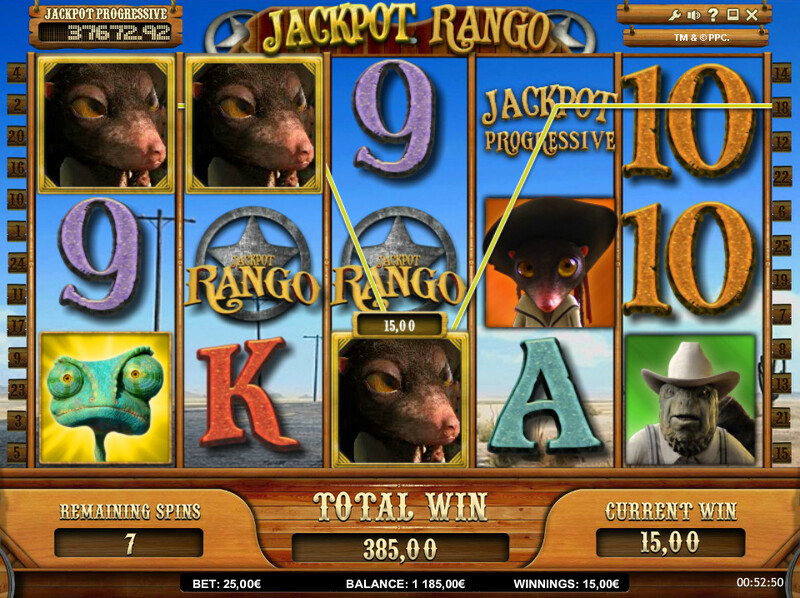 Rango is not a slot with loads of different bonuses. In fact, it only has a couple to mention. This could well put off some players, who are looking for a slot with more action and excitement. 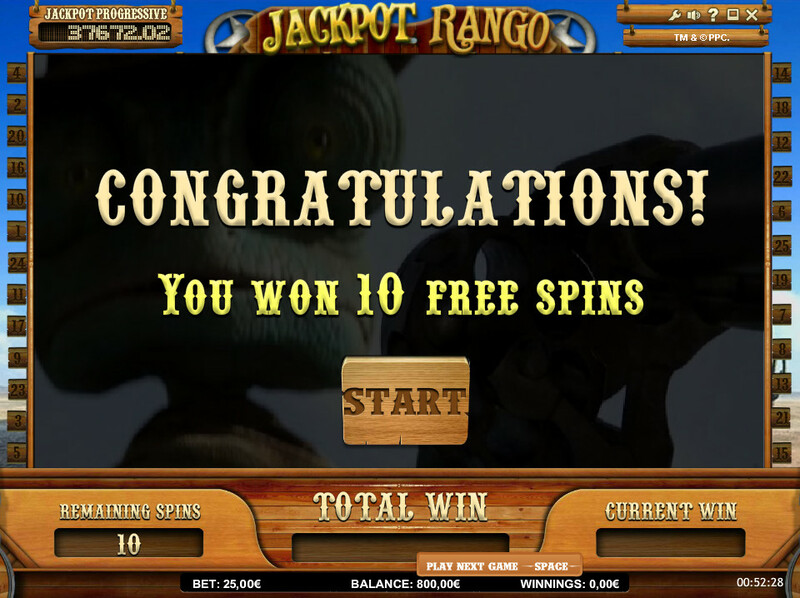 The first bonus on offer is one featuring free spins, and it is activated by getting three Rango logos anywhere on the reels. This will lead to 10 free spins, and during them a single wild in a winning combination will cause a 2x multiplier to be added. If you get two or three wilds in a winning combination though, there will be a 4x and 8x multiplier added to the wins, respectively. 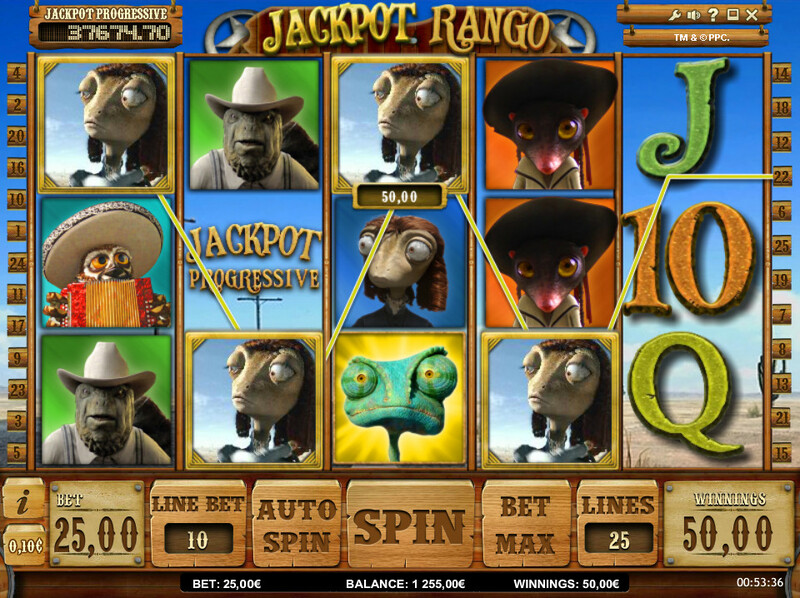 The other bonus is also a free spins bonus, and it is activated when the Rango symbol is found twice on the first reel. 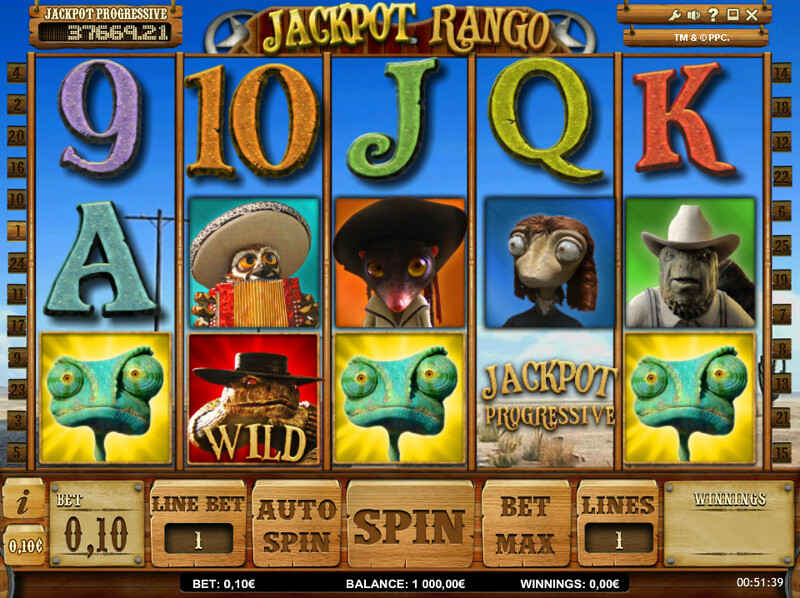 During these free spins, the first reel is held in place, as are any other Rango symbols, as well as the wild symbols. It isn’t quite as good as the first bonus game, however it can still lead to some nice prizes. While not a bonus, it is also important to mention that this slot also has a wild symbol, and this is represented by Rattlesnake Jake. This means that Rattlesnake Jake can replace most of the other symbols on the reels, in order to create some nice winning combinations. It can’t be used to activate bonuses though, and it also can’t be used in a combination that wins the progressive jackpot. It is on the reels quite a lot, so you should find this symbol regularly helps you to win prizes. So, that’s all there is to say when it comes to the bonuses at this online slot. There aren’t loads, but there are still more than enough to satisfy most people – plus they can also lead to some nice wins. 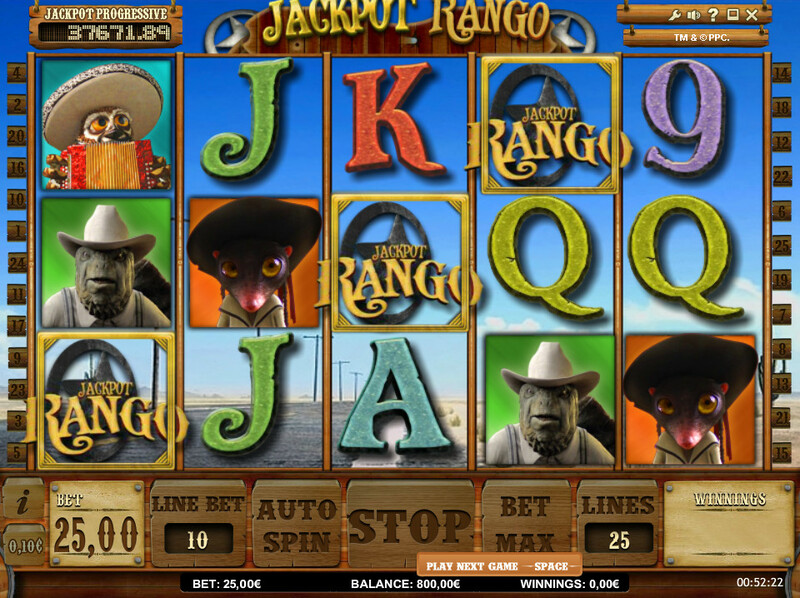 Why not have a few spins of Rango today and see if you can activate any of them?